Posted on Dec 17, 2014 by Appleton Downtown Inc.
EMBARK on an extraordinary journey across 5,000 years of Chinese civilization. From ancient dynasties to the modern day, witness inspiring stories and legends come alive on stage. Featuring classical Chinese dance, a full orchestra, exquisite costumes and dazzling animated backdrops, Shen Yun will transport you to another world. For thousands of years, China was known as the Divine Land. Its rich culture, said to be a gift from the heavens, valued virtue, integrity, compassion and tolerance. Yet, over the past 60 years of communist rule, this glorious heritage has been almost destroyed. 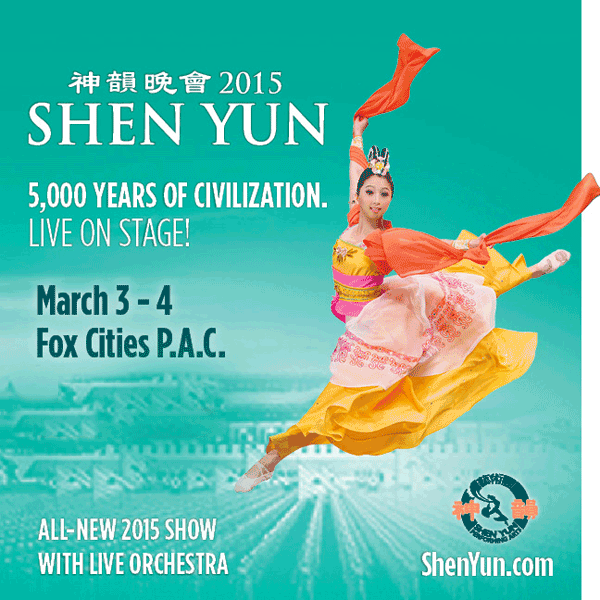 Formed in 2006 in New York, Shen Yun strives to revive authentic Chinese culture and share its beauty with the world. You may purchase tickets in person at the Fox Cities P.A.C. Ticket Office. Mon. - Fri. 10 a.m. to 6 p.m., Sat. 10 a.m. to 2 p.m.